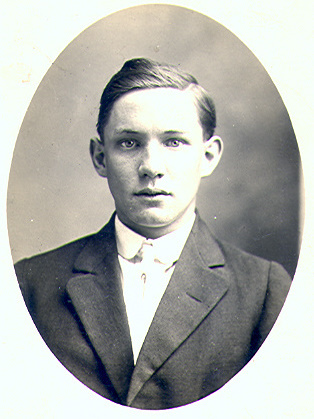 On September 12, 1917, Jacob Increase Meinzen fell 100 feet from a ladder at La Belle Iron Works in Steubenville, Ohio. He did not survive the fall. He was just 23 at the time and left behind a young wife and 4-month-old daughter. Jacob is my maternal grandfather's younger brother. La Belle Iron Works - fall off ladder 100 feet. a person whose death was supposed to have been caused by violence, had been found within said county. 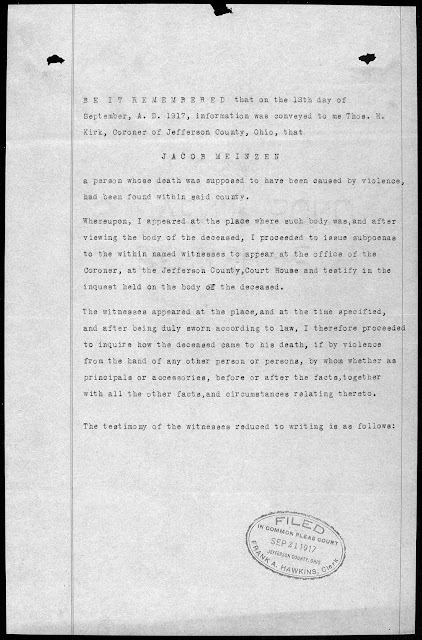 Whereupon, I appeared at the place where such body was,and after viewing the body of the deceased, I proceeded to issue subpoenas to the within named witnesses to appear at the office of the Coroner, at the Jefferson County,Court House and testify in the inquest held on the body of the deceased. The witnesses appeared at the place,and at the time specified, and after being duly sworn according to law, I therefore proceeded to inquire how the deceased came to his death, if by violence from the hand of any other person or persons, by whom whether as principals or accessories, before or after the facts,together with all the other facts,and circumstances relating thereto. A. Lincoln Ave., Steubenville, Jefferson County, Ohio. Pike Road. Q. For whom do you work? A. La Belle Iron Works. A. I am a pipe fitters helper. Q. Where were you and Jacob Meinzen working when the accident happened. A. Top of #1 Furnace, we were on the very top platform. A. We were measuring pipe for new liner piece, we had taken the measurements and started down, Jacob Meinzen had come down the ladder three or four steps, then he came back up again to allow the skip to come up, he then started down the ladder again and had gotten down about four or five steps. Q. About this time where were you standing and what were you doing. A. I was standing on the platform about ten feet back, when he started down the second time he shut the gate, I opened the gate and just at that moment I saw his hands let loose, one was holding onto the railing and the other on the steps, he fell backwards. Q. What did you then do? A. I hollowed [sic] for the men to stop the skip, I started down the ladder, went to the office and told the foreman of the pipe fitting department, that my buddy had fell off the ladder at#1 furnace down into the skip hole and was killed. A. Corner of Wells and Bates Street. Q. Do you labor at the La Belle Iron Works. Q. 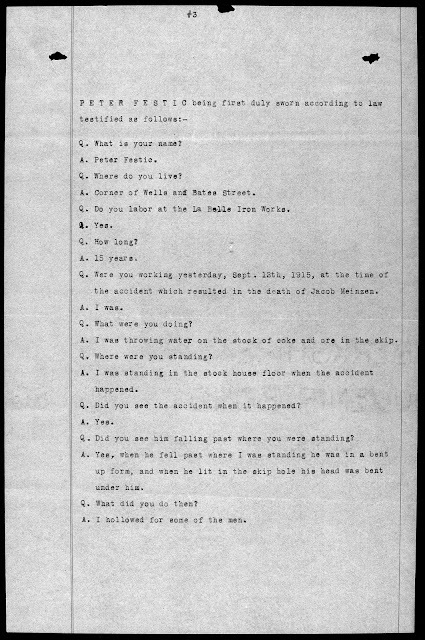 Were you working yesterday, Sept. 12th, 1915 [sic], at the time of the accident which resulted in the death of Jacob Meinzen. A. I was throwing water on the stock of coke and ore in the skip. Q. Where were you standing? A. I was standing in the stock house floor when the accident happened. Q. Did you see the accident when it happened? Q. Did you see him falling past where you were standing? A. Yes, when he fell past where I was standing he was in a bent up form, and when he lit in the skip hole his head was bent under him. A. I hollowed [sic] for some of the men. A. #1314 Plum St., Steubenville, Jefferson County, Ohio. Q. What position do you hold at the La Belle Iron Works. A. I am foreman of the Pipe Fitting Dept. Q. What time did the accident happen which resulted in the death of Jacob. Meinzen? A. I think it was about 3.30 P. M.
Q. Who instructed you to give orders to Jacob Meinzen and John J. McDonald to repair a leak on the steam line on the top of #1 Furnace. A. The Master Mechanic Wm. J. Elswick told me a leak was found in the steam line on #1 Furnace, so these two left the pipe shop about 3.30, and I instructed them to go and measure the pipe. Q. Who told you that Jacob Meinzen had fallen down into the pit hole? Q. After the accident what was then done? A. We carried him over to the hospital, the ambulance was then sent for, then he was taken to the undertakers. Height. 5 feet 8 Inches. Burn across the stomach and shoulders, internal injuries. came to his death on the 12th day of September, A. D. 1917, while at work, and being in the employe of the La Belle Iron Works, located at Steubenville, Jefferson County, Ohio. From the facts and circumstances, I do find that the deceased was employed by the La Belle IronWorks [sic], and on day aforesaid mentioned had been directed by the Foreman of the pipe fitting department to go up on the top of #1 Furnace and take the measurements of pipe needed in repairing leaks thereon. The testimony further shows that the deceased together with a helper John J. McDonald, had climed [sic] the ladder to the top of #1 Furnace, mounted the platform, had taken the measurements as directed and was about to descend. The testimony further shows that the deceased had clumb down three or four rungs on the ladder, but in order to allow the skip to pass had come back up again. 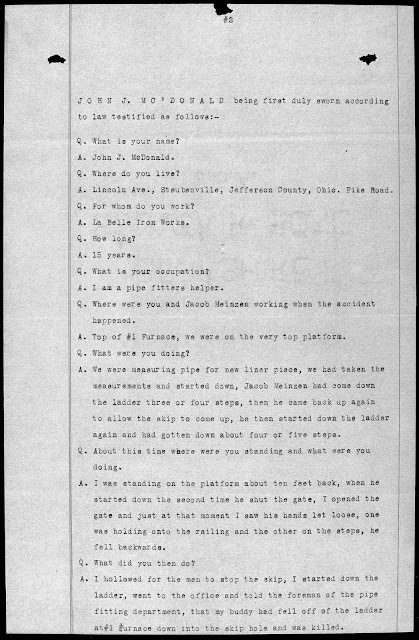 The testimony further shows he again started to descend and had gotten four or five steps down when he from some unaccountable reason released his hold on the ladder, fell backwards down and alighted in the skip hole some 100 feet distance, receiving injuries as follows: Fractured Skull, Face badly bruised; right arm crushed, burns across stomach and shoulder caused by friction, hurt internally, all of which caused his death. His death was therefore accidental. 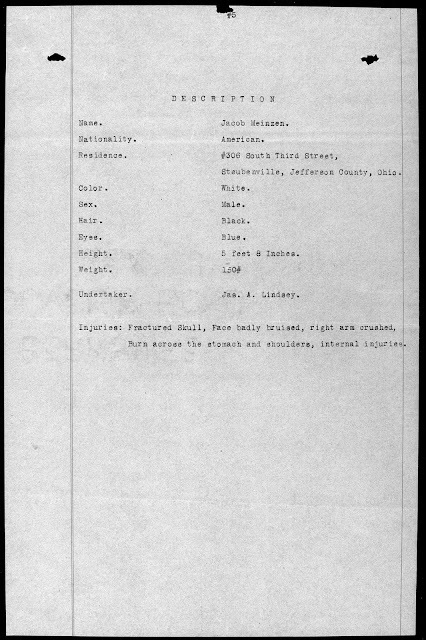 Coroner of Jefferson County, Ohio. Considering that Jacob's death was "supposed to have been caused by violence," I'm surprised that the coroner didn't ask questions about his relationship with the other men, whether there were employees who didn't like him or had a grudge against him, etc. But those questions would probably have been the responsibility of police investigators if the coroner had suspected foul play. I've never read a coroner's report before but this seems inadequate. At right is a postcard image of La Belle Iron Works in about 1920. Every time I see it I wonder which is Furnace #1. A 13 story building would be about 100 feet high. Your can read Jacob's obituary is here. 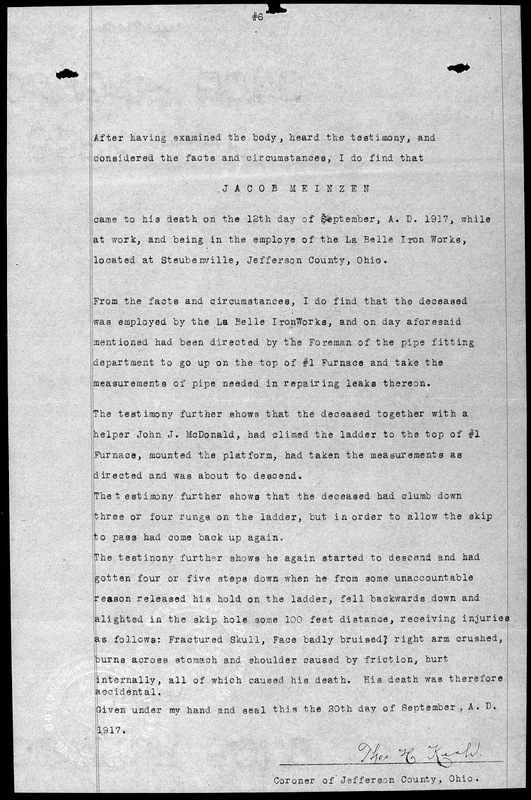 Jacob's death at La Belle Iron Works was not the first in the family. His older brother, Walter, was killed in a freak accident about ten years earlier. 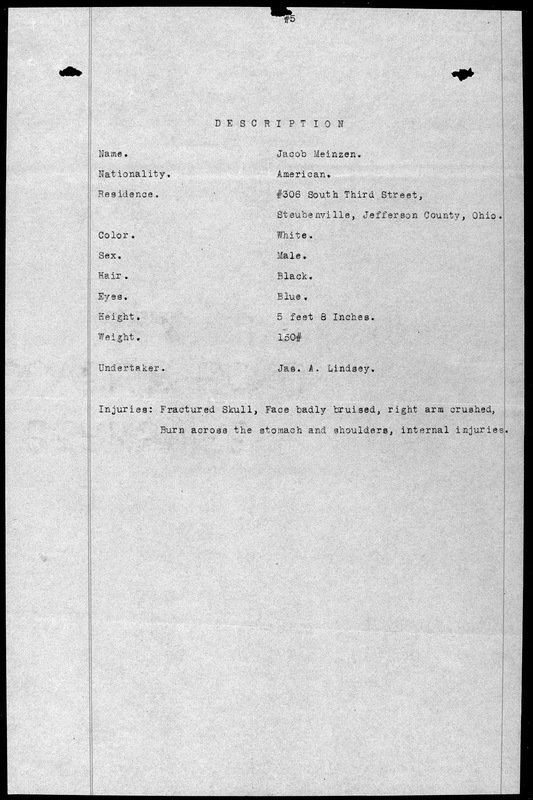 Coroner's Reports for 1907 are not currently available at FamilySearch. 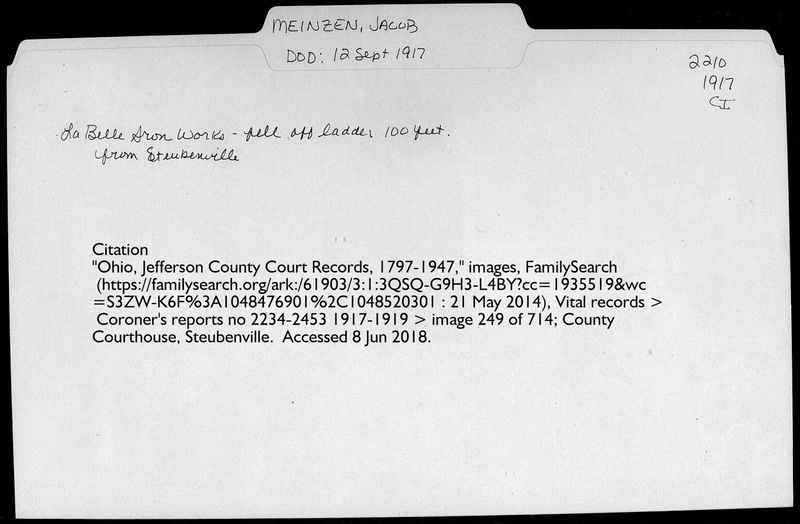 Jacob was my maternal grandfather William Carl Robert Meinzen's younger brother. They were about 22 months apart. The photo of Jacob was generously given to me by his daughter, Elizabeth, who was just a few months old at the time her father was killed. I've never read a coroner's report either. It is interesting. I wonder if the use of the word violence is a general usage to indicate a death caused by something other than a health issue. If it means violence, it does seem that the questioning was inadequate! A sad end for such a young man. I wondered about the use of the word "violence," too, Kathy. I'll probably never know more than I do now but I wondered if there were accusations and whether, as the new man on the job (compared to the others' 15 years), there was some contention between the older men and Jacob. Yes, a very sad end. I haven't read a coroner's report either. We have read and watched more detective stories than this coroner did obviously. It could be the definition of violence. I wonder about the gate. If Jacob closed the gate why did John open it? I wonder if he was startled and lost his balance. It's probably bad for me to compare modern ways and methods with what they were doing in 1917, too. And, like you, Shasta, I wondered about the gate and whether John's closing it threw off Jacob's balance or whether he had to move out of the way and lost his balance. I should be happy to have found this much information because before all I had were newspaper articles. 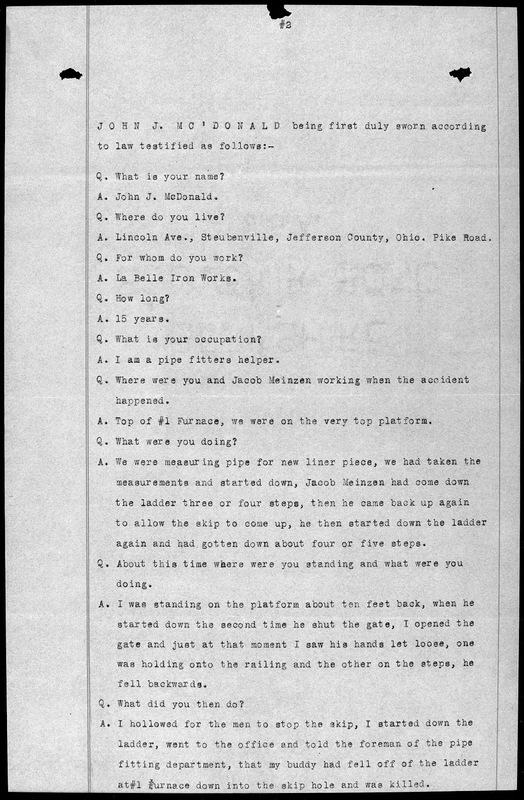 I've never read a coroner's report before and it's very interesting. It was very tragic death. Very well written. Hi, SueAnn. I thought it was interesting to see the line of questioning and how it differed between the three men. I was also surprised that only three were questioned. Such a tragedy for that little family, and for the rest of Jacob's family, too! 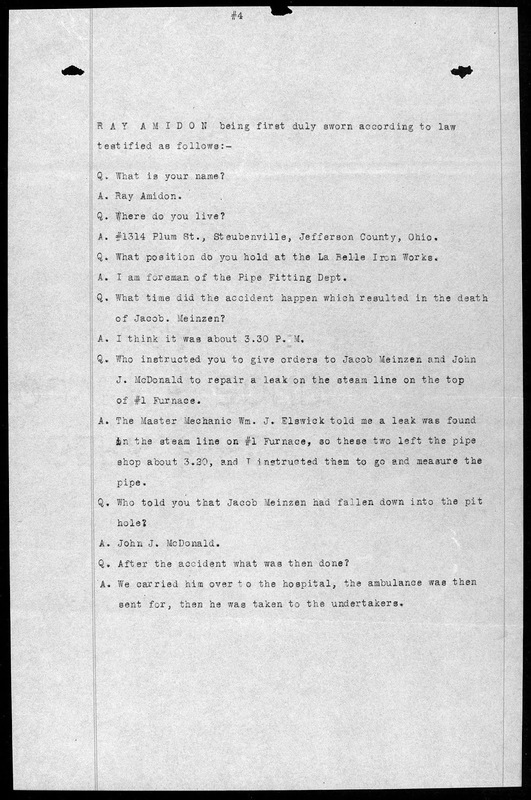 Even though coroner's reports often tell of a tragic death I love finding them and have several. I am still trying to find the one about my 3x great grandmother. Her cause of death was attributed to being tangled up in a cloths line in 1893 when she was 83. Thank you for telling your story. Oh, my, Ann! Getting tangled in a clothesline would be a horrible, horrible way to die. I usually think of 83-year-olds not having the best eyesight and I wonder if that was the beginning of the problem. I hope you find that coroner's report. Have you found newspaper articles about it? The thought of someone experiencing a fall like that is horrifying. The poor man. I agree, Liz. How awful! The report was indeed hard to read. Poor Jacob probably had time to realize he would not survive. I agree, Wendy, with both your statements. More than once I've imagined that long quick fall and wondered what Jacob was thinking. So sad! Thank you, Gwen. Heartbreaking for sure! I was pleased and surprised to find the corner's report.